Last year the Dolls for Daughters® and Toys for Boys® Program provided a new toy and more to 11,152 children in Colorado. Our annual Dolls for Daughters® and Toys for Boys® Toy Shops held the first Saturday in December, provided a new toy, small toy, book and toothbrush/toothpaste kit to 6,046 children who would have otherwise gone without. 75.4% of the families they served in 2017 had a household income of $20,000 or less a year. It takes the resources and collective hearts of many and it takes support from wonderful people like you to carry out our mission to support underprivileged children and their families in Colorado by providing toys, food and more during the holidays. This year we will have Toy Shops will be in Denver, Fort Collins, and Longmont, Colorado Springs, Pueblo, and Rilfe. Please click the link for the Toy Shop you would like more info about. Here are some ways you can get involved and support our cause. We are now accepting volunteer registrations for 4 toy shops. Join this merry band of volunteers to help make this year’s Toy Shop the best year ever for our families! The Dolls for Daughters® and Toys for Boys® Toy Drive expanded into Weld County in 2013. We provide new toys to children served by Rocky Mountain Communities in Weld County only. We are looking for additional businesses to partner with to grow our impact in Weld County. 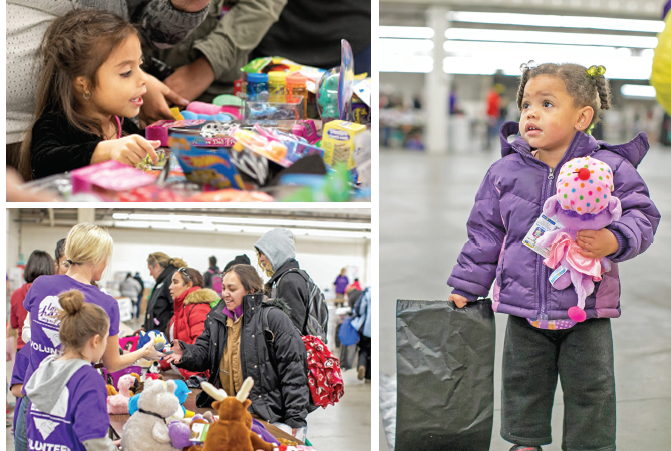 The Dolls for Daughters® and Toys for Boys® Toy Drive expanded into Grand County in 2014. We have partnered with Powder Addiction to expand our reach. Mountain Family Center is the nonprofit we have partnered with in Grand County and children served by this agency will receive the new toys we collect this year. In 2016 our Dolls for Daughters® & Toys for Boys® program expanded into Fort Collins and Longmont with toy shops. In 2017 we expanded into Colorado Springs and Rifle.